Another bureau of this model but with a different stretcher was sold in the Brook House sale, London, 25 May 1943, lot 780. A third, from the collection of Captain Manners, was sold Christie's London, 13 June 1991, lot 51. All three were made in the same workshop. The clue to their maker is provided by another bureau brisé at Blenheim Palace, the top of which bears the arms of the duc d'Aumont (1632-1704), which has been conclusively proved to have been made by Pierre Gole. The first bureau provided by Gole is mentioned in the compte des Menus Plaisirs in 1669. A second, now in the collection of the Duke of Buccleuch at Boughton House, has been identified by Prof. Lunsingh Scheurleer as the one delivered by Gole for Louis XIV in 1672 (see Tessa Murdoch ed., Boughton House The English Versailles, London, 1992, p. 199, fig. 70). Gole delivered 25 bureaux to the crown between 1669 and his death. Stylistically this bureau dates from towards the end of his life around 1680. The inventory following Gole's death in 1684 (published A. Pradère, French Furniture Makers, 1989, pp. 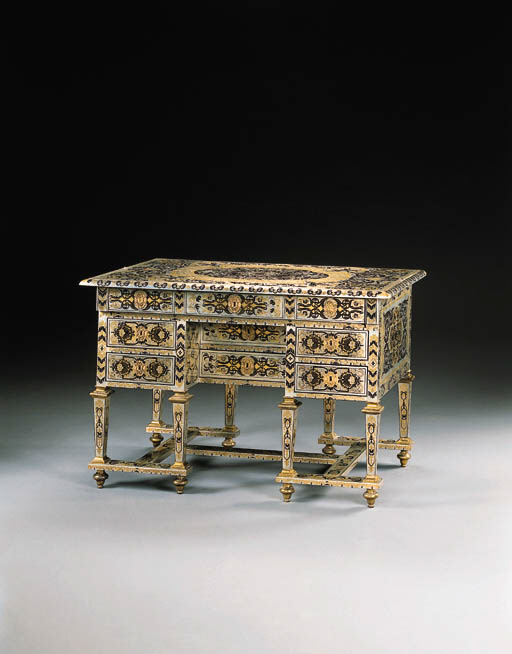 50-51) lists approximately 200 pieces of furniture of which only six were in pewter or brass marquetry. These six pieces were the most expensive in the inventory. See lot 33 for a further discussion of the career of Pierre Gole.